So it turns out that Peter Jackson really, really likes video games. 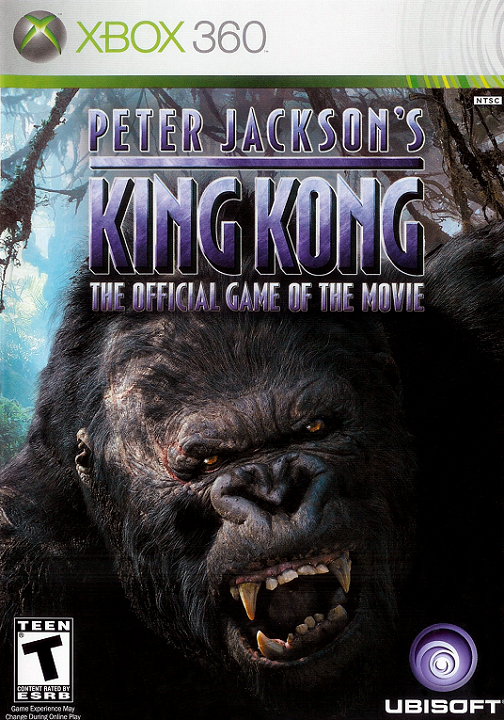 After expressing disappointment with the games based on "Lord of the Rings", Jackson did not want to make the same mistake twice when looking for a game studio to adapt his remake of the 1933 classic "King Kong". Jackson eventually settled on French auteur Michel Ancel after "Beyond Good & Evil" caught Jackson's eye. Ubisoft worked closely with both Weta Digital and Peter Jackson's own production company, Wingnut Films, using assets from the movie and the film's original cast as voice actors. Jackson also trusted Ancel with what to do with the source material to make the highest quality game possible, and the gamble paid off. "Peter Jackson's King Kong: The Official Game of the Movie" may have a stupid title, but it's an easy contender for one of the best licensed games of all time. The plot of the game is relatively close to the 2005 remake. Ambitious filmmaker and sleazebag Carl Denham wants to make the adventure movie of a lifetime, and he plans to shoot on location on the mythical Skull Island, one of the few places on Earth still untouched by Western civilization. He gathers a band of desperate and/or blackmailed crewmates, including screenwriter Jack Driscoll and starved-for-work leading lady Ann Darrow, and sets sail for the island aboard the SS Venture. Naturally, things go awry as soon as our merry band steps foot on Skull Island. The men are captured by the locals, and Ann is offered as a sacrifice to Kong, a massive gorilla who the indigenous worship as a god. Through a series of shenanigans, Ann and Kong develop a genuine bond, and all of Carl's film stock is destroyed, leaving Carl to think of a Plan B: kidnap Kong and bring him to New York as the headliner of a Broadway freak show. Kong vehemently disagrees with this idea, breaks free of his chains, goes on a rampage across New York City, and we all know what happens next. Naturally there are the expected changes, modifications, and cuts. The game skips over the first 45 minutes of the film, taking place entirely on Skull Island with the obligatory stop in New York City at the end. Most of the game follows the crew of the Venture. For about 80% of the game, the player controls Jack as he fights for survival and tries to rescue Ann from Kong, while the rest of the time players control Kong himself as he swings across the island, fights giant creatures, and protects Ann from danger. Most of the story changes are done for the sake of atmosphere. Where the Jackson film is a roller-coaster action thrill ride with occasional breaks for horror, drama, or homages to the original film, Ancel's take on Skull Island is creepier and plays up the building sense of horror. That's not to say there aren't moments of intense action in the game, but they serve as cathartic breaks from the terror, the rare peaks among the valleys of dread. Several changes are also made to the characters. 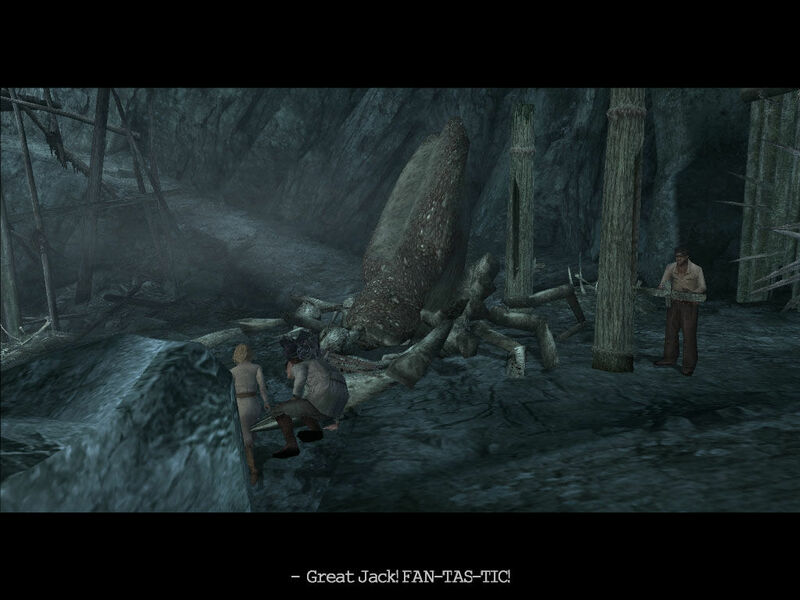 Jack is a much better character in the game; with his romantic rival Bruce Baxter cut entirely, Jack is more involved in the action, and his romance with Ann gets fleshed out. Hayes and Jimmy, minor characters in the movie, are now constant companions of Jack's, with Hayes' death moved from the middle of the movie to the very end, while the ship's captain Englehorn drops supplies in the form of wooden boxes but is mostly unseen outside of his plane until the final stretch. Meanwhile, Ann Darrow is even more of a badass than in the remake - she's the team medic, can climb to places no one else can, sometimes finds solutions to puzzles on her own, and even saves Jack's hide on occasion. Essentially, Ann only plays the role of damsel when she is clearly outmatched - after all, not even the most daring woman or man could fight off a massive gorilla and two T-rexes at once. "Peter Jackson's King Kong: The Official Game of the Movie" has aged incredibly well, which is even more impressive considering this is a 6th-generation game upscaled to high definition for its Xbox 360 release. Most of the game's impressive graphics and atmosphere can be attributed to the level design. There is nary a single right angle or jagged corner on Skull Island; everything feels natural, as if the island had already existed for thousands of years. 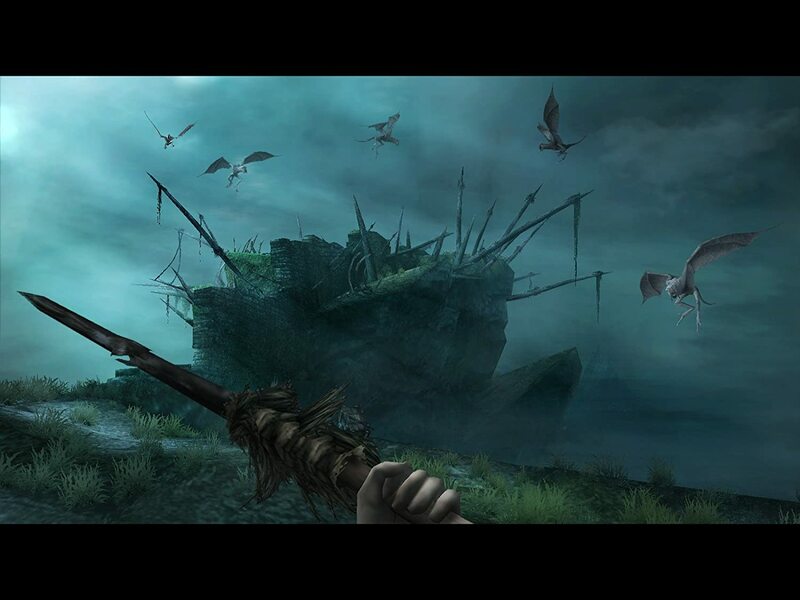 The island's inhabitants are incredibly well animated and look amazing, no doubt due to Ubisoft having direct access to Weta Digital's original creature assets from the movie. The Xbox 360 version also benefits from some extra lighting effects and a more consistent performance at 30 frames per second, which adds significantly to sequences such as Kong's big reveal, the Brontosaurus stampede, and the climactic showdown on top of the Empire State Building. "King Kong"'s sound design is in a league of its own. Chance Thomas' soundtrack makes excellent use of motifs from the movie's score James Newton Howard, and the game's stereo mixing and sound effects are incredibly atmospheric. Sound cues are even built into the gameplay, such as Jack's heavy breathing indicating low health, or the sickening crunch of a V-Rex' jaws punctuating an embarrassing death. The cast from the movie does all their own voice work, and while it's clear that voice acting isn't their specialty, they do a decent job. Unfortunately, the weak link in the graphics department is the human character models, which are clearly stuck in the previous generation. This is especially noticeable during the brief cinematics where the humans have to talk, and their lip syncing is dreadful. I also noticed a number of bugs, and not just the scurrying creatures on the island - characters got stuck in the environment, allies would call for help but look noticeably calm and stoic while being attacked, and in one sequence when running from a V-Rex, the dinosaur froze up entirely as long as I was looking at it. Judging from other guides I found online, glitchy and broken AI scripts are an issue on all versions of the game, but while it's definitely annoying, it can't take away from the overall experience. 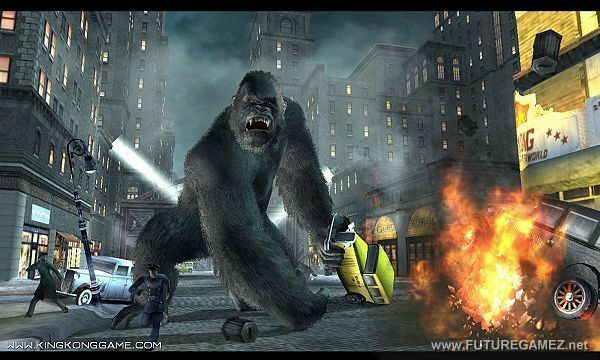 "King Kong"'s gameplay is split between two modes: first-person shooting and puzzle solving as Jack Driscoll; and third-person platforming, brawling, and chase scenes as Kong. Jack's levels make up about 80% of the game, and focus heavily on immersion. The heads-up display can be generously described as minimalist, and both the HUD and aiming crosshairs are turned off by default. There's even a dedicated button that allows the player to manually check their ammo, though the lack of sound-byte variety starts to become obvious when Jack refers to his shotgun shells as "magazines". While the atmosphere has a horror tinge to it, it would be innacurate to describe Jack's gameplay as being survival horror per se. Captain Englehorn's supply drops ensure that the player usually has enough ammo to deal with whatever situation is thrown at them. Even if Jack does run dry, there is usually a supply of infinite respawning spears or bones for melee weapons. Jack can also switch weapons with his allies, who are not only decent shots but can sometimes finish fights without Jack's help. The level design does a great job of signposting puzzles, especially the recurring motif of igniting dry shrubbery with conveniently placed fire, and using grubs to lure dinosaurs and giant insects away from the player's position. There's even an ecosystem where killing certain enemy types will cause other enemies to eat its corpse, allowing the player to sneak past. While there were some levels where puzzle solutions weren't always clear, it's still an incredible that so much of the game's design was pulled off organically. While most of the game is played as Jack, the real highlights are Kong's levels, which are a site to behold. Kong has one attack button, a grab, a run button, and a "Fury" power-up button which can be activated at any time by button mashing, as long as the animation isn't interrupted. The gameplay is undeniably simplistic, but expertly directed. Fighting two V-rexes at once, swinging across the jungle with surprising speed, and solving puzzles alongside Ann never gets old. Even with the involvement of industry legend Michel Ancel, I was skeptical about "Peter Jackson's King Kong: The Official Game of the Movie", but after playing its seven-hour campaign, it won me over. This is a great title with thrills, spooks and heart-pounding intensity. Both Jack and Kong's levels are expertly crafted, and the atmosphere is unparalleled for the time. It seems like this game was never held in high regard back in the day, and I have no idea why. VideoGameCritic wrote: It seems like this game was never held in high regard back in the day, and I have no idea why. It actually got some decent reviews. The 360 version has an 80% on Metacritic with 47/57 positive reviews, which is pretty good for a licensed game. The DS and PSP versions were hammered pretty hard though; the DS version was a different game entirely that sucked, and the PSP version was a watered down console port that cut out the AI companions and removed several levels. EDIT: There are nine achievements, all of which can be gotten by going through the story once.